Feeding a large family certainly means you will need more food, but it does not mean it needs to break the bank. I have implemented some great money saving tips around my house. I am able to feed my family of 8 (the baby doesn’t count at this point) on $250 a month on average. 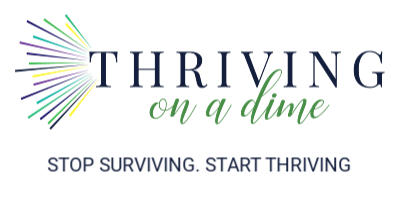 I have lived a frugal lifestyle for more than 20 years, and feeding my family inexpensively has been a huge part. I say on average because when things are on sale, I stock up so that month would be higher. In this way, the average for the year is $250. When it comes to saving money, having a budget is essential. 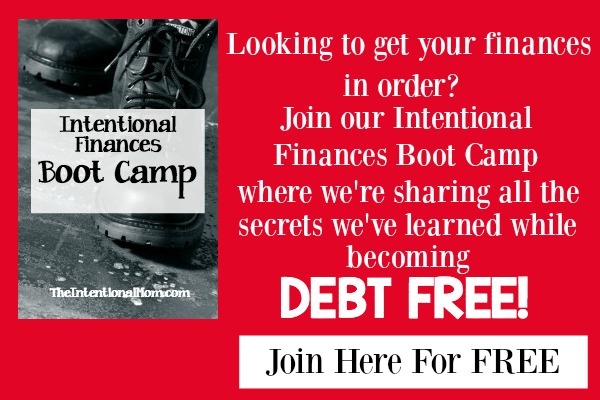 Join our free 10 day budget bootcamp where we will show you step by step how to create your personal budget with a new step for each day. Enter your email below to get started! It is amazing how much more money you can have to spend on the things you really want in life when you can save on some of the everyday things – like food. 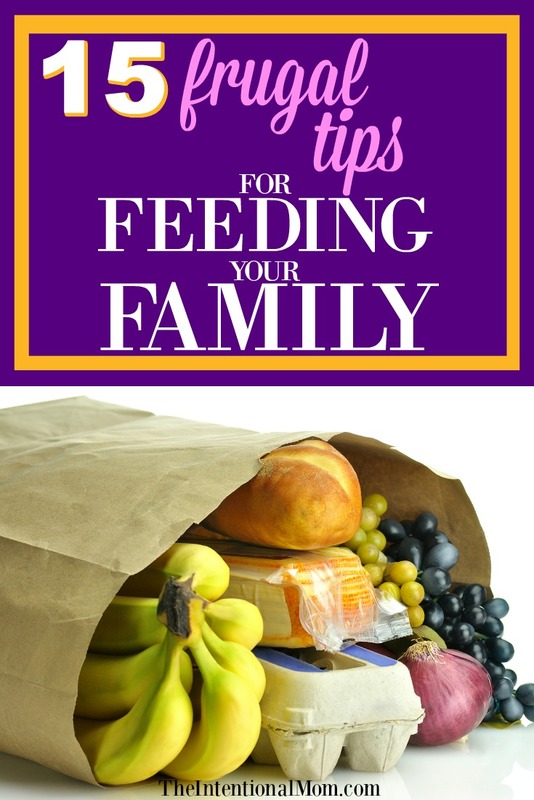 Here are the 15 frugal tips I use to feed my large family. Eat real food. Convenience foods are expensive, period. When you are making real food you are also serving a healthier meal than anything that is processed. We have a bread item at every meal, usually homemade. When bread is made from scratch I can control what goes in it, and I can pack it full of good stuff like flaxseed. Potatoes are another great way to inexpensively feed a large group, we have potatoes of some kind at most every dinner. Choose vegetables wisely. We eat regular carrots instead of the more expensive baby carrot variety, and for salad we like the healthier options like romaine or butter and bib lettuce, but we also combine in an equal amount of iceberg into the mix lettuce because it is the most cost effective variety. Protein comes from more than just meat so meat doesn’t need to be eaten as often. We also eat plenty of eggs and tuna among other things. When making tuna we also help that stretch by adding in celery, onions, and dill pickles in addition to a little mustard and mayonnaise. When we do eat meat we make that stretch at times, too. For instance, taco meat gets some refried beans added in, and when making chili we have many more beans, tomatoes, and vegetables than we do meat. When we eat chicken, pounding it into cutlets makes it stretch because everyone feels like they are eating a larger portion than they actually are. Dishes made with meat as opposed to just having a chicken breast for instance helps it stretch further, too. Shredded chicken in a stew or chopped grilled chicken in Alfredo gives everyone an ample amount of meat along with everything else that is in the dish. Water. Seems simple, but often when we think we are hungry our bodies are actually needing water. Making sure that everyone is properly hydrated during the day means people will not be overeating. Only eat fruits and vegetables in season, and when they are in season take advantage of canning or freezing them. We pick blueberries, strawberries, and apples to enjoy in various forms throughout the year. Buy milk when it is on sale and freeze it. It freezes well, all you have to do is take a cupful out of it to allow for expansion. Make your own whenever possible, this includes everything from salad dressings and sauces to french fries, mixes of all kinds, and baked goods. Soups. We eat a lot of soups since they are a great way of getting everyone their vegetables, often including ones they wouldn’t eat if they were just on their plate. Grow what you can on your own. Not only can you grace your own table with what you produce, but you can often swap with friends or neighbors who also grow different vegetables. Herbs are easy to grow as well. Combining coupons with sales is the only way I shop. My goal is to always save at least 50% on everything I buy. Most stores have receipts that provide your savings right on there so it is easy to figure out. When there is a good sale, stock up. I have had more than 130 boxes or bags of cereal at my house at one time. Find creative ways to store it if need be, but stock up when really great sales come along. I have much, much more to say on shopping, but this couldn’t be left off this list. An added bonus to this list would be a weekly menu plan. When you know what you are making in advance you are not tempted to just run up to the store to grab something that isn’t cost effective. You can always find my weekly menu plan here, in the Intentional Home, In the Kitchen Tab like this. UPDATE: You can find PART TWO – 15 MORE frugal tips, here in 15 More Frugal Tips for Feeding a Large Family. I’m going to do just that. Thank you again fro the wisdom. you’re welcome! My hope in sharing what I’ve learned along the way is that others can find things that can make a difference in their lives as these have in mine! So I totally love all these tips! We are a family of 7 right now and our grocery budget it way too high for what we can afford. Problem is, my husband and kids are picky eaters..my husband doesn’t like any veggies except corn and greenbeans (and he doesn’t like fresh greenbeans, only canned) kids don’t like chicken, tilapia, and most veggies (with the exception of 1 child) I feel like everything I make goes to waste because no one likes it. My husband is a champ and at least tries things. My kids on the other hand I have to force them to eat nearly every day at dinner time. They like unhealthy foods…Pb&j, Mac and cheese, hot dogs, cereal, pop tarts, etc…but when dinner time comes it seems they don’t like anything healthy…so frustrating and I don’t know what to do Bc our budget can’t afford all the crap food they will eat… Any suggestions? I’ll take anything at this point! I have some picky eater kids and a husband who is very much the same, although he won’t really even try things. Corn and beans…that is the only thing my hubby will eat, too. So funny. As far as kids go, I am pretty strict when it comes to them having to eat what I made. They can always choose to go hungry. I have a post on dealing with a picky eater. You should check it out, it lays it out quite well as to how I handle that! 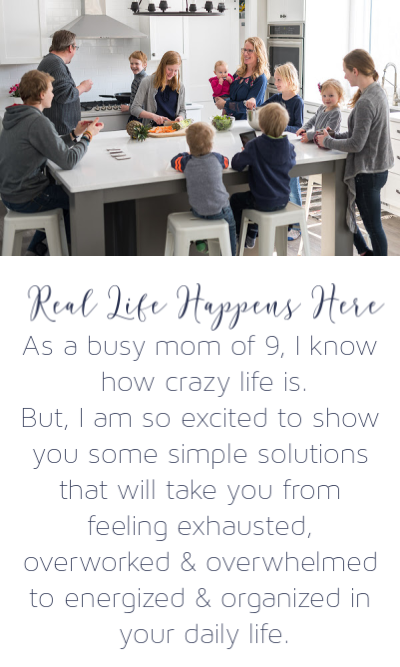 https://www.theintentionalmom.com/got-a-picky-eater-avoid-this-one-mistake-and-9-more-useful-tips/ Persistence really is key! I feel privileged though, reading you guys’ comments. My husband is a picky eater, but he’s gung-ho about eating whatever I cook (and normally he ends up liking it – there’s just a few things he straight up won’t eat, like brussels sprouts). What is it with men and canned green beans? I love them fresh, but canned they’re nasty! I usually buy them frozen, and that works for us. And fortunately, my 11 month old is not picky at all. Hopefully it stays that way. My favorite is, “this isn’t a buffet.” Thanks for sharing! Wow! $250 for a family of eight – that is amazing! Okay my $200 budget for groceries/cleaning/personal items doesn’t seem so impressive. It took time for mine to get that low. You get better at it as you do it more! These are great tips for any family, not just large ones. I practice a lot of these myself with my two kids and I. I love that you included making it yourself instead of buying the processed version at the store. Not only are they cheaper, but they taste so much better too! Thank you for sharing these! It is amazing how a little goes a long way in terms of saving. I also think that once you get used to making your own, making your own gets easier. Do you agree? My question is does this budget include health/ beauty items and cleaning supplies? Hi Ciara! Yes, it does! This is primarily because I get nearly all if not all my health and beauty supplies for free, and I don’t do a lot with cleaners. I primarily use vinegar and baking soda for a lot of things, and I also make my own cleaner. I have a lot of posts here that explain these things in more detail, but the posts on shopping at drugstores cover some of it. The rest of it I actually cover in my course. Great tips! I do some of these things, but not all. And honestly, I used to do so much better at making bread. Twins kinda threw me for a loop, and I haven’t gotten back into the swing of it. Very inspiring! Thanks! Well, twins are kinda a big deal! I have a family of 9…. I needed this blog post! Thanks for sharing! I agree that stretching the meat and adding in other proteins helps to stretch the budget! This was a good read! Soups and salad are a great way to eat healthy and stretch the budget!